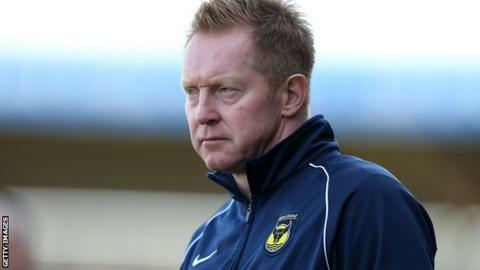 Gary Waddock says he has arrived at Portsmouth to assist manager Andy Awford - not replace him. Waddock was appointed assistant manager on Friday following the departure of Alan McLoughlin earlier in the month. The 52-year-old former QPR, Aldershot Town, Wycombe Wanderers and Oxford United boss has most recently been coaching at Conference side Barnet. "I have come in to support Andy Awford, his staff and players," Waddock told BBC Radio Solent's Sportshour show. Waddock spent time at QPR, Millwall, Bristol Rovers and Luton Town during his playing days and represented the Republic of Ireland at international level. He has enjoyed some success in management, leading Aldershot to the Conference title in 2008 and Wycombe to promotion to League One in 2011. However, he says he is comfortable in the number two position. "I have done this role before at MK Dons with Karl Robinson so I'm comfortable with the position," he said. "I've been a number one, but I've been a number two also. "I know the league and have experience of the league and players. I'm here to support Andy and really looking forward to working alongside him." And Waddock says he hopes he can help turn things around at Fratton Park. "It's not nice when anybody loses their job and gets the sack," he added. "He [McLoughlin] had a fantastic playing career. You feel for anybody who loses their job. "I'm coming in to try and push the club forward. That is my focus."